I have a special treat and giveaway for you just in time for all of your Holiday Cookie Baking! SO…yes, today is all about Cookies… but the Super Healthy kind…and YES! There is such a thing. I promise. I am talking about the latest cookbook from nutrition educator, recipe developer, and author, Hallie Klecker. The title alone lures you in: Super Healthy Cookies: 50 Gluten-Free, Dairy-Free Recipes for Delicious and Nutritious Treats. I have to tell you, up front, that I am literally in love with her new cookbook. Every single one of the gluten-free, dairy-free cookie recipes in this book are full of incredible nutrition and loaded with antioxidants, fiber, healthy fats, and plant-based vitamins and minerals. There is not one recipe in the book that would make me feel guilty about feeding any of these cookies to my kids. Plus, all of the recipes are simple enough to have the kids join in the prep process as well. I promise that you will enjoy the recipes in this book and you will feel so good about knowing that even if you (and the family) are eating all of these goodies, you are all getting a punch of nutrition to go along with your little treat. You will want to add this one to your Christmas list… It is also a perfect gift to give to anyone you know that enjoys cooking with some of the healthier ingredients out there. I already have a few people on my list that will be receiving this book as a gift from me…hopefully they just aren’t reading this post…. And, because I am feeling in the giving spirit, today, I am giving away TWO copies of this book. UPDATE: THIS CONTEST IS NOW CLOSED. THE WINNERS WILL BE CONTACTED BY EMAIL. To enter to win one of your own copies of the “Super Healthy Cookies” Cookbook, just simply do One, Two, or all Three of the following. Just leave A SEPARATE COMMENT for each one that you do so that you can earn an entry for each. 2. Follow Cook It Allergy Free and/or the Daily Bites on Facebook, or tell me if you already do. The contest will end on Thursday, December 13th at 9.am PST. The winners will be announced then. You must be at least 18 years old to enter. And one more thing before you go off and enter for your chance to win… make sure to check back here next week. I am going to be part of a fun Gluten-free, Dairy-free (and Allergy-Friendly) Progressive Holiday Dinner event being hosted by Hallie Klecker, the author of the website Daily Bites and, of course, this cookbook. I follow Daily Bites on FB. I follow both on fb :). I have this cookbook and it IS great! So many simple healthy recipes! The ingredients are few, so they are easy to customize, too. I so love this cookbook! It’s genius and delish! slightly cookie obsessed I am…. following both on FB too! I love cookies. Need dairy-free recipes. Interested in making healthy desserts. I’ve been eating gluten and dairy free for a while now, but have pretty much stopped baking treats since then. I would love to have this cookbook so I can start making some healthy treats that are both gluten and dairy free! I follow both Cook It Allergy Free and Daily Bites on Facebook. Following Cook It Allergy Free and Daily Bites on FB and retweeted on Twitter and posted on FB. I have been dairy free since birth, but I’m new to the gluten-free diet per doctor’s orders as of this year. I’ve had to “re-learn” how to eat. But I’m definitely feeling a whole lot better. This cookbook looks like a perfect fit for my new kitchen! Post shared on my timeline – plus tagged a friend who is newly dairy & gluten-free. Thanks for the info. That it is gluten-free and dairy-free. What I’m most intrigued about with this cookbook is they are for healthy cookies. I tend to not make cookies as they often call for 1-2 sticks of butter. Yikes. Would love to send my gluten free daughter to school with a healthy treat in her lunch bag. Already follow Daily Bites on Facebook! Healthy cookies that my kids can help me make!?!? What’s not to like? I love cookies, but prefer to eat food that has the most nutritional punch I can get out of it. This sounds like a fantastic idea for cookies I might let back into my diet occasionally! Healthy AND Cookies together – amazing! Shared on FB and Twitter! My family and I try out best to eat sugar and dairy free and love trying new recipes…it’s even better if they are cookie recipes! I follow both FB pages!! They have amazing ideas! I loooove making cookies and I can’t would love to try some dairy-free and gluten-free recipes! I love making healthy cookies! ….and I just shared this on facebook! I follow Cook It Allergy Free and Daily Bites on facebook. This cookie cookbook looks really intriguing. To have healthy treats at Christmas would be amazing. Just started on this GF DF Journey, the annual cookie exchange was a challenge. What intrigues me most is that “super healthy” is not an adjective you normally use paired with “cookies”, so I would really like to discover what makes these cookies super healthy and delicious! As a nutritionist I am always looking for ideas to help my friends and clients to have a treat but still keep their healthy lives going. This would be a wonderful addition not just to my family but also for when I need to suggest a healthy cookbook for those who need! I already like/follow both Cook it Allergy Free and Daily Bites on facebook! I follow Daily Bites on facebook! I’m intrigued b/c I love to bake cookies, but since going gluten-free, I’ve been afraid to try anything but box mixes. 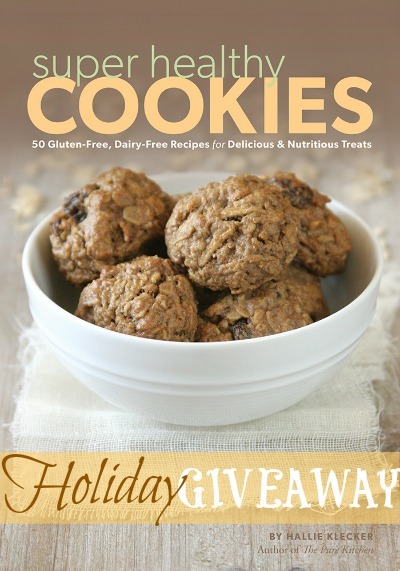 I am intrigued by this book because I am always looking for new healthy GF cookie recipes. I love to make snacks for my kids (and myself!) that are delicious and healthy. I have been dairy-free for 8 years now, but I just recently went gluten-free. I am fairly good at baking DF, but when it comes to GF–I am a little lost! And I really miss cookies. This book would be perfect for me! I already follow both on facebook! I recently started following Daily Bites and have been learning so much! I had never thought of “cookie” and “healthy” going together! The book sounds great and since I enjoy baking goodies for my family, this sounds like it would be a great treat for me! I already liked Cook It Allergy Free on Facebook, and now I am a new facebook fan of Daily Bites! Who doesn’t love cookies?! This book looks awesome to be able to bake for friends while being allowed to eat them myself since I am gluten and dairy free. Thanks! Trying to avoid so many ingredients yet providing a nutritious treat for your children that makes them feel like normal kids is what intrigues me about this cookbook. My boys LOVE helping me bake, too, so that would be an added bonus! I already like Cook it Allergy Free on Facebook. I already like Daily Bites on Facebook! I’m following your page on Facebook as well as the Daily Bites. This book looks great. I shared it on facebook. It looks like it offers many healthy delicious options that are safe for people with food allergies like me. Awesome! I love having new ideas for baking gluten free. Experimenting is fun! I am planning on going gluten free after the holidays, my daughters have decided they are vegan, an everyone loves cookies. It would be nice to find recipes we can all enjoy! I feel like I am *constantly* looking for new healthy cookie recipes! This book has been on my wishlist since it was introduced! I love the idea of a healthy cookie. Thank you for the giveaway. I have Hallie’s other cookbook, and love it! I’m intrigued by the idea of making treats that are *good* for you and taste good too! Follow you both on facebook. I would love to see what recipes this book contains because although they are gluten/dairy free, my daughter also needs sugar free and we forget that processed white sugar is also terrible for our bodies. First, I adore baking!! I am always looking for inspiration or just something right out of the book to bake and know it’s going to come out great! I’m excited to have new healthy gluten-free cookies in my arsenal! I follow “cook it allergy free” on facebook. I love baking and the idea of healthy cookies that I can eat really intrigues me. Would love to give this to my neighbor as a gift – she is new to gluten free! I follow both sites on Facebook! I am very intrigued by this cookbook because I love baking and cooking, I love eating healthy, and I do have a gluten and dairy sensitivity. This book would really bless ma and inspire me to want to share my passion itch other people. I take eating healthily and taking care of my body very seriously, but I also want to eat delicious food! My sweet tooth always welcomes new recipes and I’ve had my eye on this book for a long time! Thanks for the giveaway! I follow Daily Bites on facebook and have shared it with family and friends. I love the idea of healthy cookies. My son loves to bring a treat with him to school – this is perfect! I recently started The Virgin Diet which eliminates dairy, eggs, gluten, sugar, etc so I’m looking for healthy cookbooks. I already follow you on FB? I LOVE cookies! Any kind of cookies and if they are healthy then all the better! I would love to win this cookbook! I have the Pure Kitchen and follow Daily Bites – just love Hallie! I adore Hallie’s recipes, and this book looks over the top!! This book is great for those of us who can’t do the dairy or gluten and wish to have something to share that we can eat when going to potlucks. Being healthy makes it even better. OH! This book is on my Christmas list too! Back in my pre-gluten days, I made a batch of cookies every week! It would be awesome to expand my repertoire. Thanks for the chance to win. I liked both the facebook pages! This cookbook looks amazing! I am gluten,dairy and sugar free and finding good recipe can be tough. I love the idea of a cookie cookbook because I believe that even sweet treats can be made healthy! I would love to win this book. I am following you on Facebook!! I pinned your book on Pinterest! I am always looking for cookie recipes, especially around the holidays, that are gluten free and dairy free. It is great if you can make cookies that are good for you but that the “non-GF” people in your life like too. It’s a bonus! I would love to win this book! With 8 kids I need this book! Trying to eat healthy and keep them interested is a challenge! And sharing on Facebook now. Can’t believe I wasn’t already following you on FB, but now I am! I’m very intrigued by this book! I’ve had enough of treats that may be allergen-free, but still unhealthy. Now following cook it allergy free on Facebook. Thanks for sharing. The book looks great. I love eating healthy cookies and feeding them to my family for a sweet treat! And I have just heartily endorsed you on Facebook and shared the link to this book giveaway. Thanks! I am intrigued that these cookies are both gluten free and dairy free. Now I and my husband can both eat them. I am in need of allergen free cookie recipes so this would be the perfect way for me to be able to make cookies I can enjoy this Christmas!! I’m intrigued by the fact that the recipes are all gf and df! I’d love to try them with my boys. I like your Fb page. Thanks! already ‘like’ your fb page!!! If these are truly healthy and not just allergen free then I would love to have this cookbook! The thought of being able to give my children cookies on vacation guilt free sounds wonderful. My oldest is gluten intolerant, possibly celiac but we have not had it officially diagnosed. Winning this book would be spectacular. I shared the post on my Facebook. Healthy and cookie what could be better. This really interests me because healthy cookies make such great snacks and snacks are what I really struggle with. What intrigues me? Any cookbook that is allergen free intrigues me. I have dairy, egg, wheat and peanut allergies. I really need this cookbook. COOKIES! We all love cookies, so to have a cook book that is full of gluten free and healthy cookie recipes sounds like heaven. I just started cooking and eating gluten free so I’m always looking for new recipes. I have been looking for cookie alternatives for Christmas, so I’m excited about this book. Thanks for letting me know about it! I already follow you on FB and Twitter! I just shared your link on FB! I also liked Daily Bites on FB! I am always looking for healthy cookie recipes. We are gluten, dairy and sugar free. I’d love to see what’s inside this book. Thanks for the chance to win. My family and I adore cookies so to have inspiration in the kitchen for more healthy cookies would be fabulous! I follow Cook It Allergy Free and Daily Bites on Facebook. I shared post on Facebook. I have struggled with digestive issues my entire life, and have radically changed my diet for the last 4 years. I also just recently got married and luckily was blessed with a man who has been open to changing his diet radically as well. I would LOVE a copy of her cookbook to be able to make cookies for my sweet husband that we can both enjoy & feel good eating! The thing that intrigues me about this book is that there are not many out there that are BOTH dairy and gluten free. It is nice to find one and one that looks healthy and good! I am also sharing this on FB and have liked your FB page. Looks amazing! I would share the recipes in this book with others. I would recommend it to the lady who is in charge of the “Central Iowa Celiac Connection” to add to the library for people to check out. I would share it with my local librarian as a possibility for her to add to the library. I would use it for recipes to take and use for church Fellowship. If I had it before December 19, 2012, I would take to a chain grocery store when they have a gluten free party December 19, 2012 from 4:00 P.M. – 6:00 P.M. They have stores in at least 7 states. Hy-Vee is the name of the chain. I know three of their dietitians and two sort of. I get newsletters from two of the dietitians. I would let a friend know about it. Her daughter and son-in-law have decided to eat gluten free. I would check out the rules for the cooking section of the Iowa State Fair and if I could, I would make something for one or more of their contest. I hosted a gluten free fair. I want to do it again. I would share it there as well. I know a physical therapist who has some gluten free clients and her senior daughter has gluten free friends. they know I attend gluten free events and have asked me to get copies of recipes for them. One of the product convention for Gluten Free and Autism will be held here in the Des Moines area. I can check to see if I can display it there. People from all the surrounding states are invited to this event. I have told the Expo group from Madison, Wisconsin that I will help at their expos when I don’t have conflicts with the dates. They plan a Kid’s Expo in March. These are a few of the ways I can share the book. I am intrigued by this cookbook because I am gluten and mostly dairy/sugar free & always experimenting with new baking, but cookies are my challenge! i would love to have this cookbook to use on a regular basis in our home. my son, now 18 months, was born with many allergies and we are working to heal his gut and his allergies. i’m new to being g/f and to baking/cooking allergen and gluten-free so i need all the help i can get! thank you sooooo much for the chance to win this. i happily follow you on Facebook! My sister-in-law was recently diagnosed with celiac disease and I’ve been researching recipes ever since to make sure we can have family dinners that don’t leave her feeling left out or singled out with separate dishes. It would be great to expand my gluten-free dessert recipe box, too. Most Gluten free deserts are high in starches, so the super healthy part sounds amazing. Would love to try these recipes. I am drawn to anything that covers are biggest allergies, gluten and dairy! Both my sons have allergies to egg,dairy and soy. Finding recipes that are allergy free and taste good is hard to do. This cookbook sounds perfect for us. I’ve been in a cookie-baking frenzy lately, and could use some recipes that are a little healthier! Wow she’s been busy. A whole cookbook on cookies. YUM! As an allergen-free baker, I’m always looking for great recipes and inspiration! Would love a copy of the book. I like Cook it Allergy Free! I really like the idea of cookies being healthy and incorporated into my children’s snack, as opposed to cookies being bad for them (ie, full of sugar!) and trying to avoid them. I’d love this book since I’m always looking for new healthy recipes! Yes,I follow you and Daily Bites on Facebook and you guys always have wonderful recipes. I just shared this giveaway on Facebook! Will you be at the GFAFEXPO in Des Moines, Iowa, April 6-7th, 2013? It is a product only convention. go to www,GFAFEXPO.com for details. I love reading your site and I try to visit once a week. i want to use some of your recipes in the future. I have so many allergies I have to alter them. I do get good ideas from you. most since finding out I have Celiac is goooodddd COOKIES!!!! Please bring good cookies back in our family’s life by awarding one of your cookbooks to me. Thank You for the hard work to help us have healthy yummie cookies!! !